These days, Interstate 44 winds southwest out of St. Louis toward Springfield and, eventually, Tulsa, Oklahoma City, and Wichita Falls. About 30 miles from St. Louis is Allenton, Missouri, where Bob Klinger was born on June 4, 1908. There was no interstate highway at that time, but there was a road nonetheless and it was a road Klinger often traveled, as much of his life (and even his death) took place generally along that road. Allentown no longer exists; it has been annexed by Eureka. Bob Klinger grew up in the area, attending eight years of school in Allenton and then four years at Eureka High School, about twp miles down the road, where besides baseball he also played basketball and served as the teams captain and coach. Bobs song Rick says, It cost a nickel a week to ride double or triple on the neighbors horse. He couldnt afford it. His older brother William (Bill) did not attend high school. Bob had to request to attend high school. Not all families thought that a high school education was necessary. He was an honor student. Like many talented ballplayers in the area, Klinger was brought into baseball through the St. Louis Cardinals’ “chain gang” system. The St. Louis farm system was so extensive -- at one time numbering more than 40 clubs -- that it was often difficult to advance within it (or "escape from it," suggest Rick Klinger), and for a journeyman right-handed pitcher like Klinger, it took nearly a full decade of persistence to finally make it to the major leagues. He wanted to play for his hometown team, but may have played more years in the majors, had he signed with another organization. (In 1938 Commissioner Kenesaw M. Landis granted 74 of the Cardinals’ minor leaguers free agency.) Klinger’s first record in the minor-league ranks was in Oklahoma with the Shawnee Robins in 1929 (though Klinger himself reported being with the Waco Navigators briefly in 1928). In his first full season, the 6-foot, 180-pound Klinger had a very good year with the Class C Western Association team, going 14-8 in 184 innings with a 2.79 earned-run average. At Class B Danville in 1930, he gave up 4.38 runs per nine innings and put up a record of 12-8. He put on some miles traveling between ballclubs in 1931 and 1932, pitching for Danville of the Three-I League (primarily) and Houston in 1931, and for four clubs in 1932 (mainly Elmira, but also Danville, Rochester, and Columbus). The first time Klinger had a winning record after 1930 was in 1933, when he had a full season with the Red Wings in Elmira. He was 16-12 with a 3.08 ERA with the Class A team (New York-Penn League), and prompted some attention by striking out 14 men in a game, a league record at the time. Klinger was actually brought up to the Cardinals in 1933, but it doesn’t show in the stats because he never appeared in a game. In 1934 Klinger was advanced to Double-A, playing for Columbus for the first of two seasons for the Red Birds: 15-13 (4.76 ERA) and, in 1935, 14-14 (4.27). The 1934 team won the American Association pennant. He split 1936 between two of the Cardinals’ Double-A teams, Columbus and Rochester, a combined 9-9. In November 1936 he married Vivian Langenbacher. The couple had two sons, Larry and Rick. Klinger made the major leagues with Pie Traynor’s Pirates in 1938 and had an excellent year, 12-5, with a 2.99 ERA. He got off to a great start with a win on Opening Day, throwing the eighth and ninth innings against the Cardinals and seeing Pittsburgh score twice in the top of the ninth to take a 4-3 lead. He built up a record of 8-1, then lost four, and then won four – pitching all season with an arm that had become sore in spring training. Klinger missed occasional starts, and in mid-September (when he was 10-5) the arm was so sore he reportedly couldn’t even raise it – but he still pitched and won his last two games. His hometown fans had honored him with a Bob Klinger Day when the Pirates visited St. Louis on August 18. One of the organizing committee was Charlie Hollocher, though the two cousins were more acquaintances than close relatives. Klinger was not nearly as successful in 1939, leading the National League in losses (with 17), though he did win 14 games, four more than anyone else on the sixth-place Pirates. His ERA of 4.36 was a little above the team average of 4.15. He developed a reputation as a bit of a Giant killer early on, 4-1 in his first year and 4-2 in his second, and seemed to beat the Cardinals with some frequency, too. The Pirates improved to fourth place in 1940, climbing into the first division under new skipper Frankie Frisch, but it was more thanks to Rip Sewell (16-5) than to the 8-13 Klinger, whose ERA zoomed to 5.39, the worst he would ever experience. Klinger was converted to more of a reliever in 1941, starting just nine games, but appearing in 35, with a 9-4 record and a 3.93 ERA, perhaps aided by an arm subject to only 116 2/3 innings. In both 1942 and 1943, Klinger got more starts. He drove his ERA down to 3.24 in ’42 and to 2.72 in ’43, with mirrored records of 8-11 and 11-8. Bob Klinger turned 36 in June 1944. Before he did, he was still subject to military conscription for service in World War II. He was apparently offered a position in a defense industry, but reportedly declared that if he were called, he wanted to serve. He was drafted by the Navy and passed his pre-induction physical at the Jefferson Barracks in St. Louis on March 7. Klinger entered the Navy in April, went to basic training at Camp Farragut in Idaho, and became one of many professional ballplayers who were able to play baseball for the Navy in morale-building exhibition games. He began pitching for the Great Lakes Naval Training Center Bluejackets, and then toured the South Pacific, playing games on several islands, including Tinian, Saipan, Peleliu, Guam, and Mog-Mog. For the Mickey Cochrane-managed Bluejackets, Klinger was 10-0. He sent back a report to the Pirates that he had actually been able to work on his curveball, and improve it. Klinger also lost weight, but when he reported for spring training in 1946, manager Frisch put him on a program to build back up his weight. The Pirates never actually used Klinger in 1946. Just about three weeks after the season began, he was released on May 7. An Associated Press release dated May 9 said he had been signed that day as a free agent by the Boston Red Sox – lucking out by joining a team that had a record of 20-3 at the time. Klinger was effectively the closer, finishing 20 of the 28 games in which he appeared, with just one start. His ERA was an excellent 2.37, and his record was 3-2. 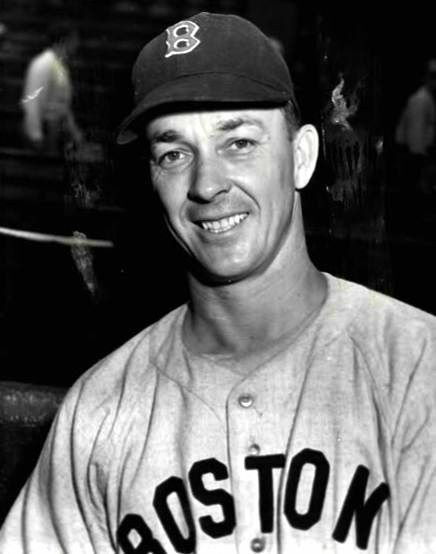 On the 1946 Red Sox, Klinger was reunited with Mace Brown; they had been teammates at Pittsburgh, in the Navy, and at Boston, and remained close friends well after baseball. The Red Sox faced the Cardinals in the 1946 World Series. Dubbed by some a “National League castoff,” Klinger wasn’t called on until Game Seven in St. Louis, no doubt pitching in front of a number of hometown fans. He’d had to rush home from Boston to Pacific, Missouri, just a few days before the Series began, when his son Rick had been diagnosed with polio.. In Game Seven, the Red Sox scored twice in the top of the eighth, tying the game, 3-3. To hold the Cards at bay and keep the game tied into the ninth, Red Sox manager Joe Cronin had his choice between Klinger, a right-hander, and Earl Johnson, a left-hander, to pitch to Enos Slaughter leading off the bottom of the eighth. Tex Hughson also could have been called upon. Cronin picked Klinger, who had worked 57 innings in relief and led the league in saves, with nine. Slaughter singled to center, but languished there while Klinger retired Whitey Kurowski on a bunt popup and Del Rice on a fly ball to left. But then Harry Walker hit a looping single to left-center which was fielded casually by Leon Culberson, just in for Dom DiMaggio, who had hurt his while doubling in the two Red Sox runs. While Culberson lofted the return throw to shortstop Johnny Pesky, Enos Slaughter – who had been off with the pitch – ran all the way from first base to home, scoring the go-ahead and winning run on what became known as his “mad dash.” Earl Johnson took over for Klinger, who bore the loss that cost the Red Sox the World Series. It was the closer’s role again in 1947, and Klinger was 1-1 (3.68 ERA) in 28 games, none of them starts and 19 of them closing games. On September 24 the Red Sox released him, not even waiting the four more days until the season was over. Klinger had pretty much reached the end of his career, but there were teams still willing to give him a try. In 1948 he pitched for Oakland in the Pacific Coast League, but was released to make way for Cookie Lavagetto in mid-June; he had a record of 2-4 and a 4.18 earned-run average. Within a month he found work with Houston in the Texas League, and had a good 3.06 ERA but a record of 0-3. In 1949 Klinger worked for Indianapolis, appearing in 32 games, but with an atrocious 9.71 ERA and a record of 3-4. Even then, he was given a position with the Jersey City Giants and threw 12 innings in eight games. He had neither a win nor a loss, but recorded a 3.75 ERA. Hed reportedly been offered a position managing in the minor leagues, but his wife wanted to go home after years of moving around and he himself did not want to get involved in the politics of the job. Klinger lived in Pacific, Missouri, in his later years. It’s a community right along that same I-75, about five miles west of Allenton. After baseball, Klinger drove a concrete truck for Pacific Readymix, eventually becoming owner/operator of his own one-truck firm, Eureka Readymix. He worked at this for about 15 years until retiring in 1964. In retirement, he took up golf and carded six holes in one, and held the Pacific Country Club scoring record. He was an insatiable reader of newspapers, magazines, and novels. He was killed about 10 miles west of Pacific, in Villa Ridge, when his car was involved in a head-on accident that killed an older couple on August 19, 1977. He had been visiting a friend and perhaps suffered a heart attack on his way home, his car crossing over into the other lane. In addition to the sources noted in this biography, the author also accessed Klinger’s player file from the National Baseball Hall of Fame, the online SABR Encyclopedia, the Encyclopedia of Minor League Baseball, Retrosheet.org, and Baseball-Reference.com. Thanks to Sherry Richards and Rick Klinger. Genealogical research regarding Klinger and the Hollochers was done by Maurice Bouchard. At the time this author requested his assistance, Maurice had not known that Klinger himself listed Charlie Hollocher as his relative on an American League player questionnaire in Klinger’s file at the National Baseball Hall of Fame. After Maurice found the Hollocher connection, and this author then told him of the relationship, the circle was closed. Telephone conversation with Rick Klinger on September 29, 2011. Rick said that the Klinger family name was originally Klingler, in his great-grandfather’s day. The phrase “National League castoff” was Herb Goren’s from the New York Sun, reported in The Sporting News of October 23, 1946.